Arrange a rack in the middle of the oven and heat to 425°F. Coat a 9-inch pie plate with cooking spray or a thin layer of oil; set aside. Place the sweet potato cubes and oil in a medium bowl, season with salt and pepper, and toss to combine. Transfer to a baking sheet and spread into an even layer. Roast until tender, 20 to 25 minutes. Set the baking sheet aside to cool. Reduce the oven temperature to 350°F. Meanwhile, combine the chickpea flour, nutritional yeast, and 1/2 teaspoon salt in a medium bowl. Whisk in 1 cup of the water. Bring the remaining 1 1/2 cups water to a simmer in a large saucepan over low heat. Whisk in the chickpea mixture. Return the mixture to a simmer and cook, stirring constantly, until thickened, 6 to 8 minutes. Remove the pan from the heat and gently stir in the roasted sweet potato, spinach, garlic, and a few grinds of pepper. Transfer the mixture to the greased pie plate and bake until the quiche is firm, about 30 minutes. Make ahead: The chickpea mixture can be made 1 day ahead and stored in an airtight container in the refrigerator. As it will separate and thicken, whisk to recombine it before adding the vegetables and baking. Storage: Leftover quiche can be stored in an airtight container in the refrigerator for up to 5 days. In Recipes-list.com we have selected the most viewed recipes from category - uncategorized . Enjoy the best recipes specially selected for you! 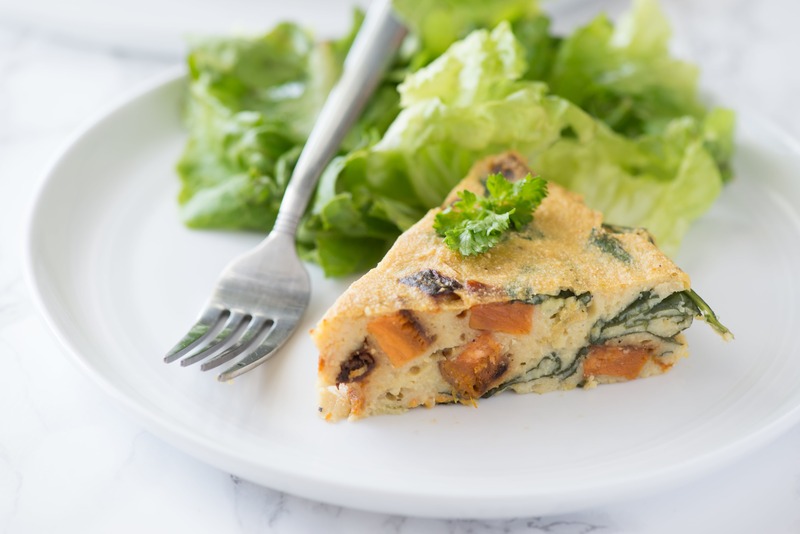 Spinach & Sweet Potato Chickpea Crustless Quiche is the right choice that will satisfy all your claims.